Minister of Finance and Prime Minister of Belize, the Right Honourable Dean Barrow presented the official budget for the 2018-2019 fiscal year on Friday, March 9th under the theme ‘Maintaining Steadiness; Consolidating Stability; Advancing Growth.’ The $1.2 billion proposed budget highlights the country’s external deficit, debts, and optimism in the growth of the economy. 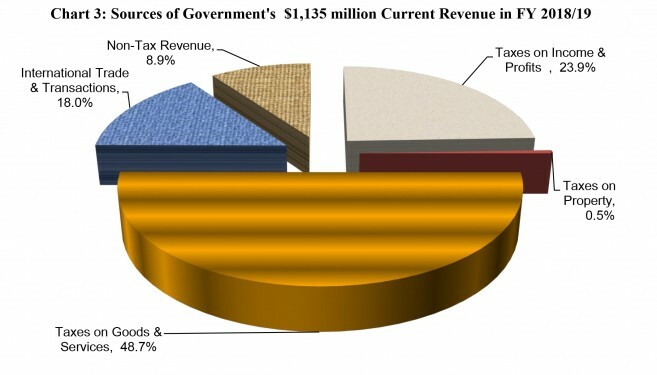 No new taxes were introduced, however, there were adjustments to balance expenditures to revenues. As for possibilities of any projects to benefit Ambergris Caye, the budget presentation did not include any concrete plans but did mention the intent to construct hospitals for San Pedro and Punta Gorda Town in the Toledo District. 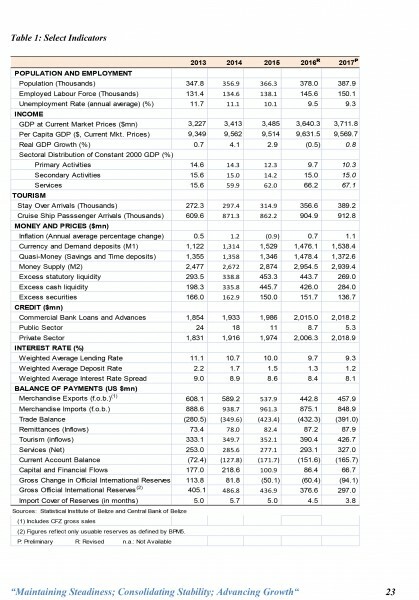 The Prime Minister in his speech said that Belize’s external deficit in the balance of payments experienced an increase from 8.1% of the Gross Domestic Product (GDP) in 2016 to 8.9% in 2017. Barrow attributed this increase to fewer grant funding, larger profit payments to foreign shareholders, and payments associated with the Superbond restructuring. He furthered explain that there was a decline in gross official international reserves as a result of the final payment for Belize Telemedia Limited (BTL) and public debt servicing. According to him, the amount at the international reserves stands at US$297, which is still the healthy equivalent of 3.8 months of merchandise imports. Adding to this, the national debt was revealed to stand at about $3.535 billion, a 93.8% of the estimated 2017 GDP. According to Barrow, this number is represented by $2.509 billion or 71% of the total owed, while the remaining 29% is approximately $1.026 billion, attributed to constituted domestic debt stock. This time, the budget presentation did not introduce any new taxes, however, there were some adjustments. These adjustments are estimated to be around $20.5 million via a 7-point strategy. “GST is to apply to the purchase of data services by telecom clients because data offers free calls.” Barrow indicated that due to this revenues have fallen dramatically in phone calls resulting in a reduction in General Sales Tax collections. “This adjustment will simply restore GST revenues lost in this voice data transition. Additionally, this measure will have no effects on the internet at schools,” said Barrow. The budget presentation also included the ending of exemptions for land clearing, crop dusting, and harvesting, while Government contracts, imports, and purchases will be standard GST-rated rather than exempt now. Additionally, the GST application to Business Processing Outsourcing will also be harmonized to ensure a level of playing field across this sector. “Excise tax applied to kerosene imports will not be synchronized with that of jet fuel, and those applied to fuel oils will be the equivalent of the rate on diesel,” said Barrow. “Again, this change will prevent mislabelling and abuse.” Furthermore, there will be a Free Zone social fee of 3% applied to goods other than cigarettes, liquor, and fuel along with a similar social fee on duty-free merchandise arriving at the Philip Goldson International Airport. It is expected that these refinements will prevent revenue slippage, promote equity and minimize incentives for corruption and abuse by collectors and payees alike. The leader of the Government then spoke about on the debts that require foreign currency repayments. 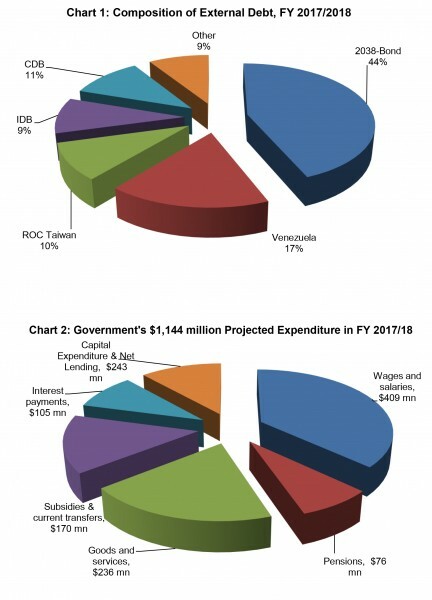 $1.055 billion is currently owed to commercial bondholders, $400 million to the Petro Caribe Loan Program and another $305.3 million to the Caribbean Development Bank (CDB). There is also a $242 million owed to Taiwan and $227 million to the Inter-American Development Bank. “This translates to 41% or 4 of every 10 dollars of the national debt being payable to these concessionary lenders,” explained Barrow. He further pointed out that some 40% of the country’s domestic debt is currently held by the commercial banks, 38% by CDB and 22% to other creditors. According to the presentation, a quarter of this debt consists of short-term Treasury Bills, and 62% of which is longer-term Treasury Notes. As the budget address progressed, the Prime Minister did not detail the potential hospital for the Ambergris Caye but indicated that it would be part of the 2018-2019 fiscal year. “This year’s budget is structured accordingly and therefore can and will be no retreat from our signature pro-poor policies: BOOST and Food Pantry; the Apprenticeship Program; the High School Subsidies; the Payment by GOB for students’ CXC exams; Funding of the Second Chance Opportunities; Tuition Assistance and a plethora of Full Scholarships; Construction of New Classrooms, Rural Water Supply Systems, Health Posts and Hospitals certainly in San Pedro (from public/private funding currently being pursued) and PG,” said Barrow in the summary of the draft estimates for fiscal year 2018/2019. The Area Representative for Belize Rural South (Ambergris Caye and Caye Caulker) has been talking about the construction of a hospital in San Pedro Town by 2020, the beginning of such infrastructure on the island is expected to start later in 2018. 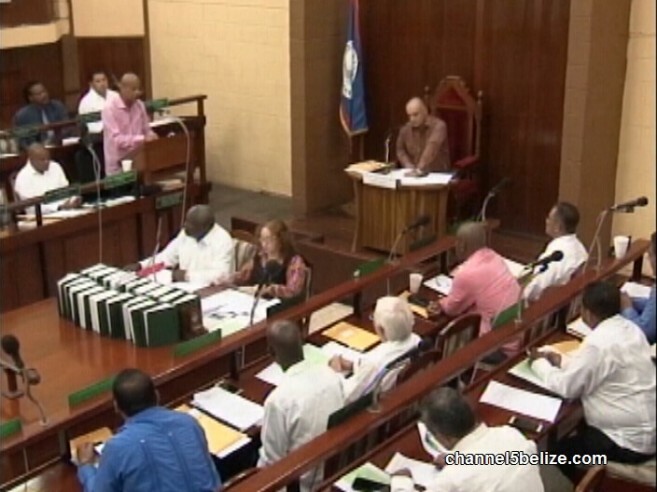 Other projects mentioned in the budget speech include the Belize City Southside poverty alleviation project, the construction of new classrooms, rural water supply systems, and health posts. As well as the upgrading of the Hummingbird Highway, George Price Highway, and the Philip Goldson Highway. Works are also scheduled to start for a new Haulover Bridge, a new airport link road and the first phase of the Caracol Road in the Cayo District. 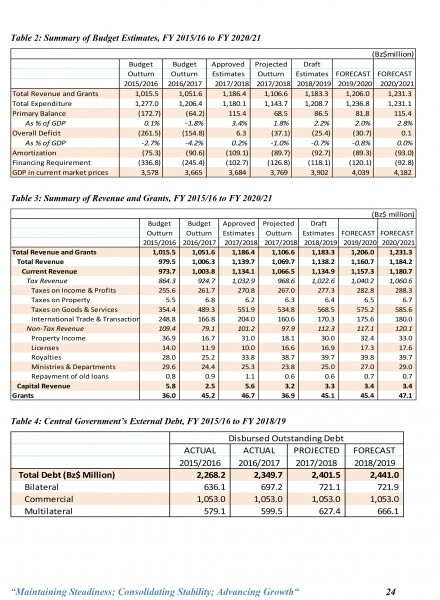 Barrow continued by stating that preliminary information shows a mixed picture heading into the new fiscal year. Barrow spoke about the guarantee of successful fiscal consolidation that is underway. 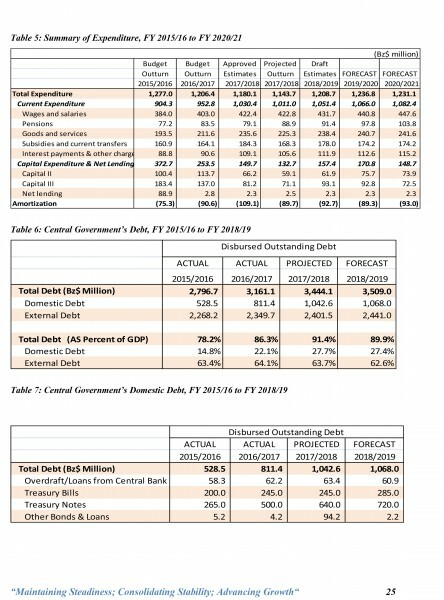 “But it is also clear that we will not meet the perhaps overly ambitious budgeted Primary Surplus Target of 3.1% of GDP, which had been set at the beginning of this fiscal year,” said Barrow. “The outturn is likely to be closer to 1.8% of GDP turnaround in the Primary Balance which was made to our creditors last year as a term and condition of the 2017 Superbond restructuring,” Barrow explained that the low expected outturn is due to revenue shortfalls which are a result of unprecedented weaker economic activity and a decrease in governmental investment. Nevertheless, the government is optimistic and the Central Bank of Belize is projecting a growth in the economy of between 1.5% and 2.0% this year. 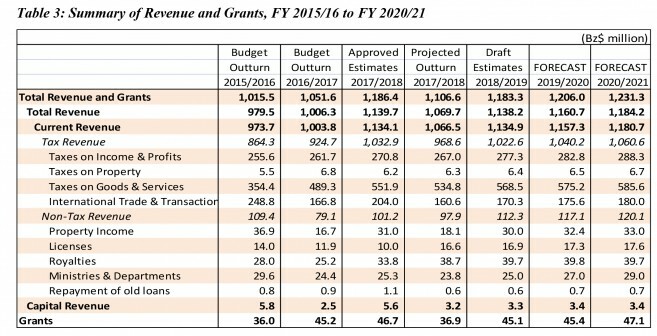 It is also projected that the total expenditure, besides the debt payments, will that of $1.037 billion with a total revenue combined with grants of around $1.106 billion. To such criticism from the Opposition, Barrow pledged that the public finances will remain firmly anchored to an always more sturdy bedrock that is the plinth of a people everlasting progress. According to him, Belize’s economy will continue to advance throughout the many years to come. The Budget debate will take place on Thursday, March 22nd, and Friday, March 23rd at the National Assembly Building in the Capital City of Belmopan.